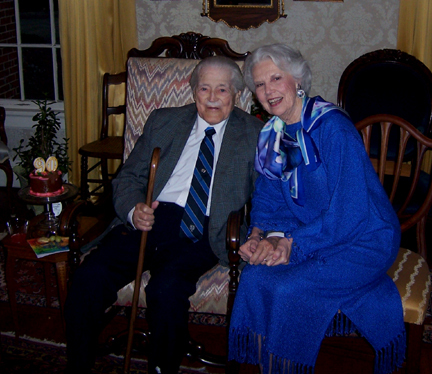 My father-in-law, George Gray Jr., and his wife Ellen (my most loyal art patron) are celebrating George’s 90th birthday. Since I have been married to George III for over 40 years his family is as close as any of my blood relatives. On November 29th Ellen threw the biggest birthday party I have ever attended. George was ever the perfect host, alert, affable and gracious. What a guy! ~ by Sandra Lynn Gray on December 18, 2007. Happy 90th Birthday! What a lovely couple they are! Thanks Suz. They are lovely people. I’ve given you an award, Nouveau Fauves! You can find it here. I love hearing that in-law are wonderful! One of my most favorite people in the world is my mother in law. 🙂 p.s. they are a very handsome couple by the way.